As promised, today’s a double comic day! We’re making up for last Thursday when we couldn’t get a comic posted. Enjoy! Heh, heh. A prisoner of his instincts. At least he’s nice about it . . . I love that he’s a vegetarian. Great double strip! Well worth the wait Jim! Glad you got all your ‘puter issues resolved! Wallowmuck is a great addition to the cast! Just found your comic today – love love love the art. Working m’way thru the archives now. Thanks!! No matter how many times I view this strip and all preceding strips, I still find every panel of yours quirky and gorgeous to look at, in an addictive way. Thanks for giving me a blast each and every comic! I know my compliment has no real constructive basis to it, but I simply feel I have to say it because I appreciate your work. @Johnson: Your post has all the real constructive basis I need. Thanks a lot! And welcome to everyone who’s new! haha Love this one. All the strips are great but this one gave me a serious chuckle. Making my time in this dull art history class a lot better. Art History? Dull? Say it isn’t so! 2- P-panel 3 = panel 3 of every Dinosaur Comic? Me: Huh? Can yu repeat your self please? 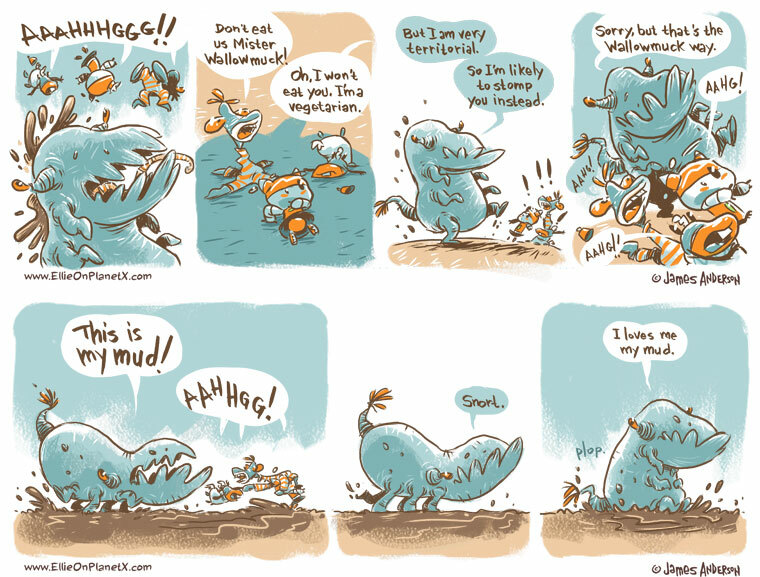 Wallowmuck: I love my mud.